Coconut oil is an oil obtained from copra (coconut dried fruit flesh) or from the juice of coconut milk. Oil content in the old coconut meat is estimated to reach 30% -35%, while oil content in copra reached 63-72%. Coconut oil as other vegetable oils, contains triglyceride compounds. Composed of various fatty acids and 90% of them are saturated fatty acids. For Coconut oil that has not been purified as well, it contains small amounts of non-fat components such as phosphatides, gums, Sterols (0.06-0.08%), tocopherol (0.003%), free fatty acids (<5%) and a Little protein and carotene. Sterols serve as stabilizers in oil and tocopherol is an antioxidants. 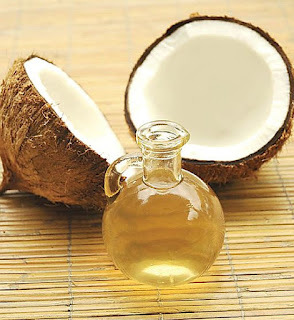 Coconut oil is rich in medium chain fatty acids (C8 - C14), especially lauric acid and meristat acid.The existence of this medium chain fatty acid (medium chain fat) is relatively high, making the coconut oil has several properties that can fight some harmful compounds in the human body. Not only can fight harmful compound, Coconut oil can provide so many benefits for our healthy. This traditional wet way is very simple to do, you can do it by Using the common equipment in the family kitchen. In this methode, coconut milk was extracted from the grated coconut. Then the coconut milk heated to vaporize the water and agglomerate parts instead of oil Called “blondo”. The blondo is separated from the oil. Lastly, blondo are squeezed to remove the remaining oil. The wet fermentation way is somewhat different from the traditional wet way. In Wet fermentation, the coconut milk left until skim and cream separated. Furthermore the cream is fermented to stimulate the agglomeration of non oil coconut milk part (especially protein) from oil during heating time. Some microbes will developed during fermentation processes, especially microbial that produce acid. The resulting acid causes the coconut milk protein undergo the clumping process and easily separated during heating stages. The wet lava process is somewhat similar to the wet fermentation methode. On This way, coconut milk is given a centrifugation treatment (3000-3500 rpm) in order to split the skim from cream. So there is separation of oil-rich fraction (Cream) from a poor fraction of oil (skim). Furthermore the cream is pickled and than acidified by adding acetic acid, citrate, or HCI to pH4. After that, the coconut milk is heated and treated like Traditional wet ways or fermented wet ways, then treated Centrifugation once again to separate the oil from the non-oil section. addition of alkali compounds (KOH or NaOH) for neutralization (Remove free fatty acids). adding absorbent material of color, usually Using activated charcoal and or bentonite to produce an oil Clear and clear. the flow of hot water into the oil to evaporate and Eliminating compounds that cause a bad odor Desired. Copra is chopped, then crushed into powder. Then Copra powder is placed in the extraction chamber, while the solvent is on Evaporation chamber. Then the solvent is heated until it evaporates. Steam The solvent will rise to the condensation chamber. Condensate (solvent vapor Melt) will flow to the extraction chamber and dissolve the powdered fat copra. When the extraction chamber is full of solvents, the solvent Containing the oil will flow (fall) by itself towards the previous evaporation chamber. In the vaporization chamber, the oil-containing solvent will evaporate, While the oil remains in the evaporation chamber. This process Lasts continuously for up to 3 hours. The oil-containing solvent is evaporated. The steam is condensed On the condensate is not returned to the evaporation chamber, but flowed to a solvent shelter. This solvent can be used again for another extraction. This evaporation is done until there is no longer expected Solvent residue on the coconut oil. Furthermore, the oil may be treated with neutralization process, bleaching and Odor removal. So, you just read different type of coconut oil extraction methode, did have any clue which one is the best methode? Coconut oil is claimed to contain fatty acids Trance that give bad effect to our health. This trans fatty acids in Coconut oil caused by imperfection of The coconut oil processing that use high temperatures and chemicals Pale and seducer. Traditional coconut oil Processed with physical treatment (heating) as well has a weakness, this process has a High peroxide number that can trigger Rancidity process. Therefore, the best coconut oil extraction process is by processing it without using precipitating chemicals and high temperature, than the best way is by fermentation. Some fermentation treatments can be done with the addition of materials that can limits the Growth undisireble microbs such as salt and Sugar or by the addition of isolates microbes such as yeast or enzymes. Treatment with fermentation is expected to be done without chemicals and can avoid the formation of trans fatty acids. The advantages of the coconut oil extraction with fermentation is that this methode is practical, Energy thrifty, low residue, Low acid number and free of Cholesterol inducer compound.